Police Spokesman T.J. Smith says the second officer involved in this incident has been placed on administrative duties pending the outcome of the investigation. "On August 11, 2018, at approximately 11:45 a.m., officers were working a special cross borders crime initiative in the area of the 2500 block of Monument Street. Two officers encountered a man, whom one of the officers is familiar with. After the first encounter, officers released him and the. approached him again to provide him a citizens contact sheet. When he was asked for his identification, the situation escalated when he refused. The police officer then struck the man several times. He ultimately was taken into custody. He was then provided medical treatment for the injuries that were sustained. Almost immediately, the Baltimore Police Department began receiving videos of the confrontation. The Office of Professional Responsibility was immediately dispatched to the area. As a result of the information available, Interim Baltimore Police Commissioner Gary Tuggle, suspended the officer immediately. The State’s Attorney’s Office was contacted and provided information related to this case. The individual encountered by the officers was not criminally charged and was released from custody. The officer who struck the individual has been a member of the agency for just over one year. We are conducting a thorough investigation of this behavior and will follow the facts wherever they may lead. Anyone with additional information or video footage is asked to contact the Office of Professional Responsibility at complaints@baltimorepolice.org, (24 hour line) 1-833-288-7245 or 410-396-2300 during normal business hours. According to a shared post on the Baltimore Police Department's Facebook page, the incident happened Saturday on Monument and Luzerne. It's a beating that appeared to have left the man on the receiving end, bloodied. Tuggle said part of their investigation will be reviewing body worn camera footage. 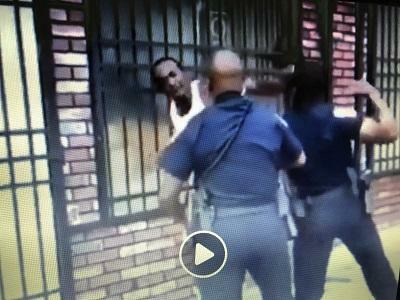 If anyone witnessed this incident police are asking you to contact the Office of Professional Responsibility at 410-396-2300 or visit the following website: https://www.baltimorepolice.org/transparency/citizen-complaints.